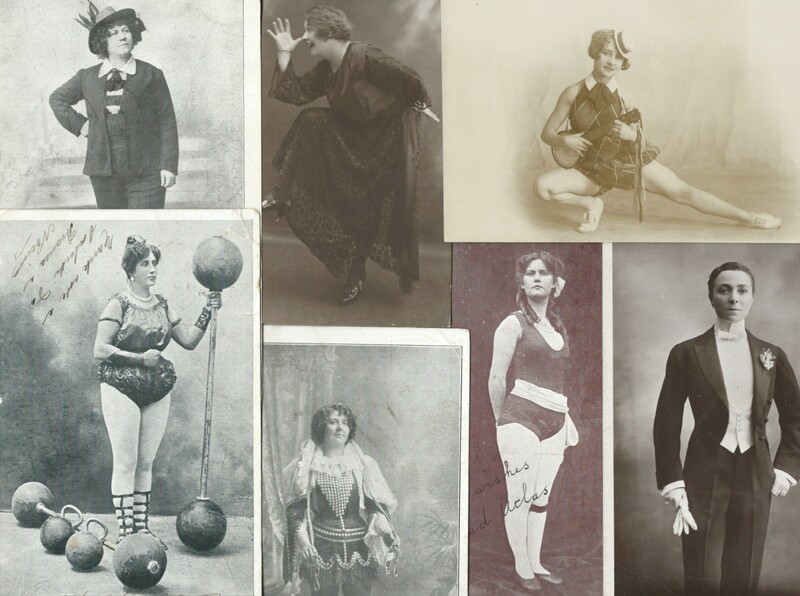 The music hall offered women artistes a degree of independence not always found in the world outside but still left them open to the vagaries of music hall managers, hangers-on and the ‘casting couch’ mentality. Women were campaigning for the vote during the peak days of music hall and the halls reflected this as they reflected all life. Kitty Marion was a music hall artiste and suffragette. Born in Germany in 1871, she came to England in her mid-teens to live with her sister, Dora. She started her career as a singer in musical comedy and went on to appear in music halls billed as a singer or comedienne. 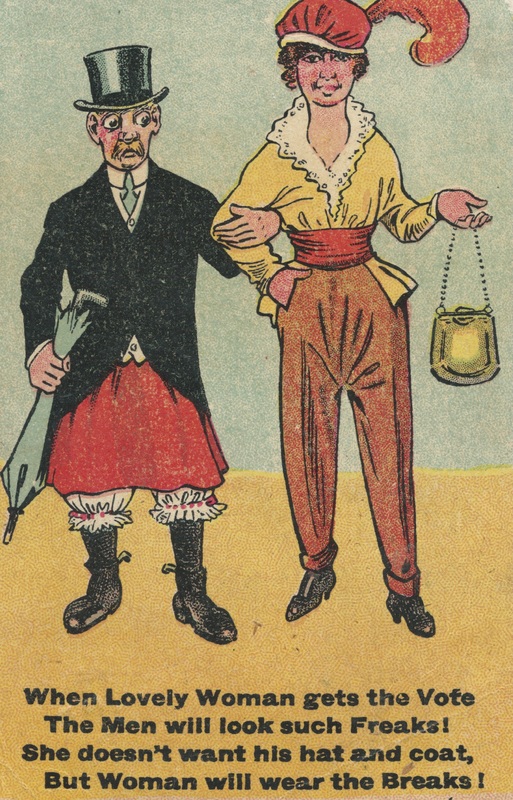 She was a member of the WSPU (Women’s Social and Political Union) and for some years juggled direct action with music hall and pantomime work. 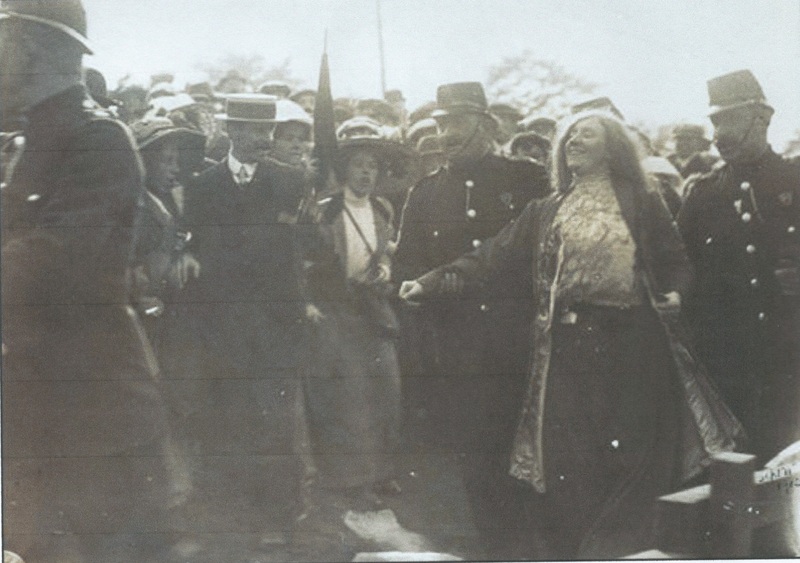 She threw stones and broke a Post Office window during Lloyd George’s visit to Newcastle in 1909, was imprisoned for a month and force fed after going on hunger strike. Kitty’s account in the Aberdeen Daily Journal states she barricaded her cell with her plank bed and placed herself so that she would be injured if the door were forced. This resulted in the door being removed from its hinges. On being force fed, she resisted saying she was a professional vocalist and might injure her throat. When she passed a doctor on the stairs she smacked his face and then broke ten panes of glass in her cell. She gnawed a hole in her pillow and emptied out the contents, tore up a bible and set fire to her cell, being carried out unconscious. In 1910 Kitty threw stones at the window of the Moss’s Empires Ltd who owned and managed music halls. She acted to call public attention to ‘the disgraceful state of the theatrical profession’ where ‘it is almost impossible for a woman to earn her living respectably on the stage’. This time she was bound over but became more involved in direct action, choosing imprisonment rather than a fine each time. She was force fed 232 times and received the WSPU hunger strike medal and, amazingly, managed to appear in pantomime shortly after. 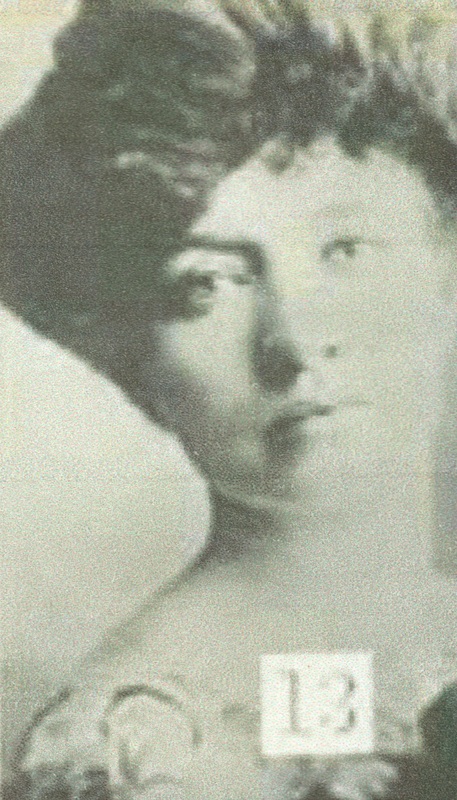 The numbered photo of Kitty Marion, above, is from the police surveillance files of the time. Militant suffragettes pulled faces and would not stand still when having their prison photos taken so the police resorted to covert photography. 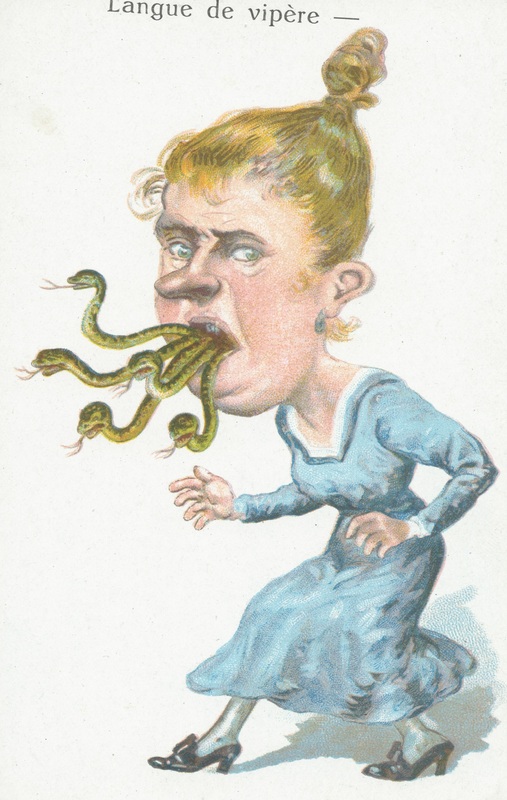 Kitty, of course, had her music hall postcards which the authorities could use. Kitty helped to form the Actresses’ Franchise League which sold suffrage literature and put on propaganda plays. She travelled the country working and protesting and in 1912 attended the National Eisteddfod in Wrexham where Lloyd George was to speak. He began to speak in front of an estimated crowd of thirteen thousand and each time he spoke a suffragette would shout their message. The women were bundled out but more took their places with the crowd shoving and pushing the women. It was reported that a large hank of auburn hair was torn from Kitty’s scalp and later exhibited at the offices of the Western Mail in Cardiff. Kitty eventually gave up the stage for full-time action and was involved in an arson attack on the grandstand at Hurst Park race course. There is also strong evidence that she was responsible for an arson attack on the mansion owned by the the Hastings MP, Arthur Du Cros but she was never charged. In 1914, with the outbreak of war, she was threatened with deportation to Germany but was allowed to go to the United States instead, where she became a well-known activist, helping to establish America’s first birth control clinic. Marie Lloyd was a staunch supporter of women’s rights and in 1909 had a small part in a suffrage play called ‘How the Vote was Won‘ at the Oxford in London. 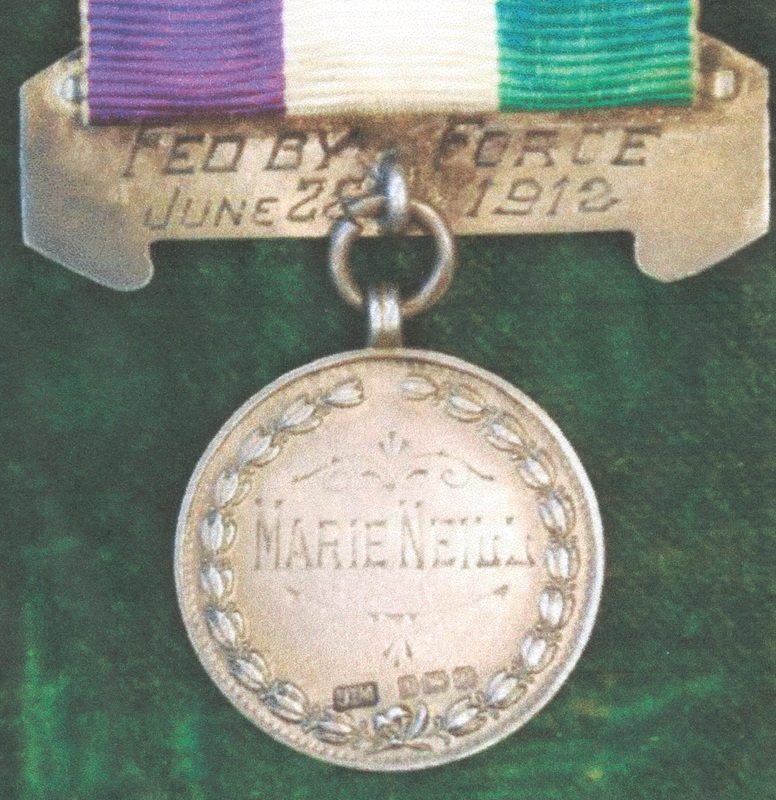 She is also reputed to have smuggled the militant suffragette, Annie Kenney, through the police cordon, into a theatre in a large hamper labelled ‘Marie Lloyd‘ so that she could speak to the crowd. Another performer, Wilkie Baird, took advantage of the political situation to sing an anti-suffragette song, ‘Put me on an island‘ with the refrain: Put me on an island where the girls are few/ Put me amongst the most ferocious lions in the zoo/ Put me on a treadmill and I’ll never fret/ But for pity’s sake don’t put me with a suffragette. 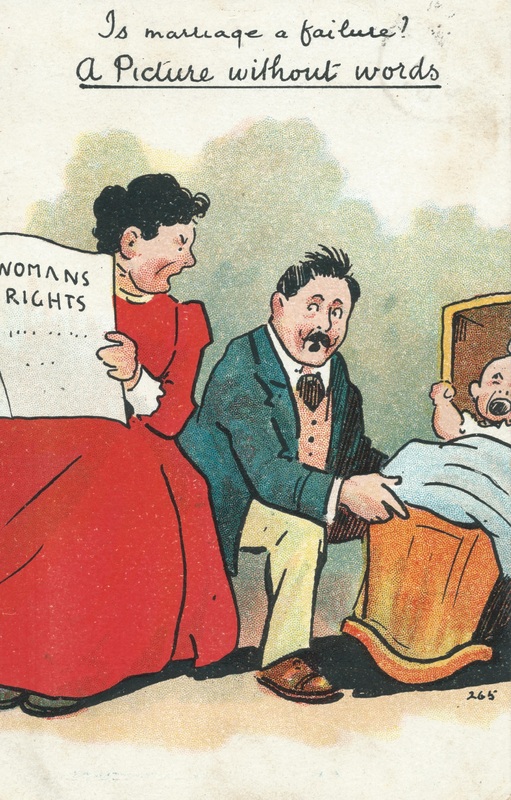 Below are some anti-suffrage postcards. This entry was posted in direct action, Eisteddfod, Force feeding, Kitty Marion, Marie Lloyd, Suffragettes and tagged Annie Kenney, Kitty Marion, Marie Lloyd, suffragettes on July 27, 2015 by Monomania.